EyeVac Touchless Vacuum Reviews - Is it a Scam or Legit? Using built-in infrared sensors, a powerful motor; large, an easy-empty canister, and a sleek, modern design, the EyeVac Touchless Vacuum claims to effectively clean hard floors. Advertised as the most convenient way to clean all hard flooring types, the EyeVac Touchless Vacuum promises to help you tackle messes as they come—including those caused by pets, without having to bend down to sweep. On top of this, its HEPA-level filtration can help eliminate harmful particles from the air. Each of their three models accomplishes this using features like a powerful motor, large canister size, dual filtration system, and a variety of activation modes. So, whether you’re looking at hardwoods, tile, or stained concrete floors, or are interested in picking up dirt, hair, food, or pet litter, the company tells us they provide an effective—and potentially pain-free—way to clean. EyeVac's touchless vacuum lineup certainly seems compelling for a wide range of applications. But is it necessarily the ideal choice for you? Give us a few minutes, and we'll walk you through everything we learned during our research. Regardless of model, all of EyeVac’s stationary vacuums feature a sleek, compact design, touchless activation (infrared sensors automatically turn on the cyclonic suction), and between 1,000 and 1,400 watts of power, helping you get rid of all kinds of debris without requiring you to bend down. Simply sweep toward the opening, and the suction will start and last for 7.5 seconds. As this suction occurs, the dual filtration system (pre-motor and exhaust filters) will go to work, which meets HEPA standards for removing airborne particulate matter like pollen, mold, dust, dust mites, and smoke. Any debris sucked up is also stored in an environmentally safe canister, eliminating the need for messy vacuum bags. In order to maintain this level of filtration, the FAQ points out that each filter will need to be cleaned every three to four canister dumps using a mild soap and warm water. The vacuum’s Canister Full Light will turn on when it’s time to empty. Combined, the company points out that anyone who can use a broom can use an EyeVac. Given the fact that each of the company’s models features this same basic functionality, let’s zoom in and learn exactly what differentiates each one. What Are the Differences Between Each EyeVac Model? Each of these models features a 1,400-watt motor and a 3.8-liter (1.6 gallon) canister, along with the same 13 x 7.5 x 20.5 in dimensions, 15.6 lb weight, and 85 dB sound power level. Based on this powerful design, the manufacturer points out that these models are ideal for commercial environments, such as hair salons, pet groomers, boutiques, kitchens, and small businesses and commercial offices. 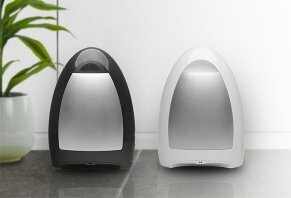 Per EyeVac’s FAQ, the difference between the two is that the Pet model is only available in Designer White, while Pro is also available in Tuxedo Black. Comparatively, EyeVac’s Home model decreases the wattage to 1,000 and the canister size to 1.4 gallons. It’s also slightly smaller at 11 x 22 x 15 in and is available in both Designer White and Tuxedo Black. According to the company, the Home model works best in the "kitchen, den, dining room, mud room, workshop, dorm or any room with a hard floor," and is built to pick up debris like pet hair, litter, dirt, mud, and dust. 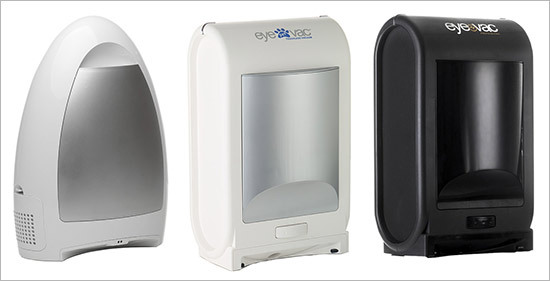 The EyeVac Pet (middle) and Pro (right) models feature the same specs but differently color availability, while the Home model (left) features a motor with 400 fewer watts and a smaller canister size. How Much Does the EyeVac Touchless Vacuum Cost & Where Can You Buy It? Replacement canisters, exhaust filters, pre-motor filters, and pre-motor filter screens are available directly through the company for between $7.99 and $19.99, each. All orders include free shipping. All manufacturer-direct EyeVac purchases come with a 30-day satisfaction guarantee, less S&H charges. Since these models weight 15 pounds, keep in mind that it might not be inexpensive to ship your vacuum back to the manufacturer, depending on your location. EyeVac’s vacuums are also available through online retailers like Amazon, Wayfair, Walmart.com, and QVC.com, as well as brick-and-mortar stores like Bed Bath & Beyond, Best Buy, Home Depot, and Kohl’s, to name just a few. Prices seemed to match those through the manufacturer at the time of our research. Money saving tip: However, keep in mind that purchasing locally could save a decent chunk of change on return S&H if you’re dissatisfied (again, depending on your location), as well as make the return process as easy as a quick drive. Furthermore, many of these stores send out frequent coupons, which could help you save even more money on the purchase price. Customer support can be reached at 512-485-3050 or via their sites contact forms. What Are EyeVac Customers Saying In Their Reviews? On their website, EyeVac’s models cumulatively had more than 120 customer reviews at the time of our research, who had given them an overall rating of about five stars. Common compliments referenced ease of use, effectiveness, and reduced bending over, while complaints (what relatively few there were) frequently related to noisiness and that the vacuum can be heavy if it needs to be moved. Among well over 1,000 pieces of customer feedback on Amazon, Wayfair, and Bed Bath & Beyond’s websites, EyeVac’s models had a similar nearly five-star overall rating, with many of the same compliments and complaints. As a company, JPaulJones, L.P. is based out of Austin, TX and has been in business since 2003. Despite their length of time in operation, the only product shown on their corporate website was the EyeVac Touchless Vacuum. Are The Other Touchless Stationary Vacuums Like EyeVac? In fact, while we’ve reviewed somewhat similar ASOTV products like Kick Sweep Vacuum and Kick Vac, the only product we encountered during our research competing directly with EyeVac’s models was the HairVac by VacuMaid. How does it compare? As we can see, while these are both upright touchless vacuums, they seem to occupy their own niches. For example, if you own a salon or dog grooming business (as but a couple of examples), HairVac might be an obvious choice, since it’s built specifically for picking up hair. On the other hand, if you just want to make quick touchups easier, and/or to avoid having to bend over every time you sweep, at the lowest possible price (including meaningfully lower ongoing costs), then an EyeVac model might be more aligned with your needs. They’re also the only models featuring automatic infrared sensors, if this aspect is important to you. Finally, as we outline in our Vacuum Cleaner Buyer’s Guide, the HEPA-level filtration offered by EyeVac’s models could be beneficial if anyone in your home or office is asthmatic or suffers from allergies or other respiratory ailments. Pro tip: Since they come with bagless canisters, though, just be sure to take extra precaution when emptying your EyeVac, so the particulate matter it contains isn’t re-released into the air, thereby negating any of its HEPA benefits. While we didn’t test them ourselves, based on what we learned from the manufacturer’s website and online customer feedback, EyeVac’s three touchless vacuum models seem to offer several features that could help make it easier and more convenient to sweep your hard floors. Not to mention that they could help you throw away that annoying dustpan and avoid the potential pain of bending over in the process. Or, that they’re really the only game in town with the exact same set of features. On top of this, they have an overwhelmingly positive reputation among consumers, which could be a good indication that you might experience much of the same. And if you’re ultimately not satisfied, EyeVac (as well as most of the retailers it’s sold through) offers easy-to-honor refund policies. If you’re looking to potentially save the most money, though, the lack of return shipping (if necessary) and potential availability of in-store coupons might make shopping locally a logical place to start. Write a Review for EyeVac Touchless Vacuum!